In 1977 and 1978 when I was 10 and 11 I went away to camp in New Hampshire at Brookwoods which is a camp owned by my mother’s Brother-in-law’s family. Many of my cousins where there and it was a wonderful experience until my second summer when I became ill and spent a week in the infirmary. I found this letter to my mother in my “Life-Box” that she diligently kept for all of her kids along with a few other fun ones like one where I informed her that one of my sisters, who shall remain nameless, was sitting at a table full of boys, all by herself. What a wonderful brother I was! It was a Christian camp so I’m sure they were all gentlemen. What I love about this one in particular is how I’m telling my mother how much I love her and miss her and then I go on to to tell her something that probably freaked her out and had her call my uncle to get on the phone with the camp and do something quick! 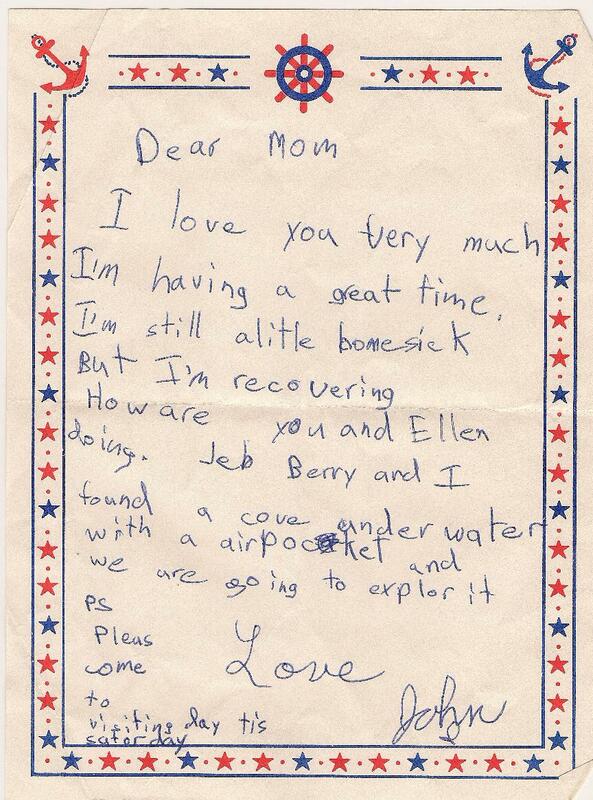 I don’t remember if my parents came to visit that weekend but I do know that I never found any cave with an air-pocket. People at the camp were famous for pranks and telling stories of creatures in the woods and having you search the camp for a left handed wind sifter or some non-existing gadget. Somebody probably told me about the cave and it became my mission in life to find it. It was a wonderful experience that I remember fondly and I hope to visit it someday and reminisce. I did an incredible amount of backpacking, boating and learned many things that I still draw upon today. This entry was posted on April 25, 2014 at 2:34 am and is filed under Uncategorized. You can follow any responses to this entry through the RSS 2.0 feed. You can leave a response, or trackback from your own site. Hey there, Cindy K. from Seattle via Memphis. Just wondering how your hat is doing? Cheers!